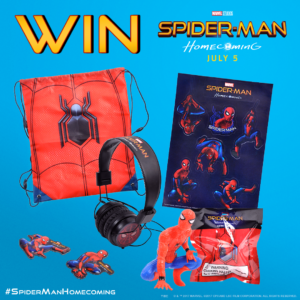 To celebrate the release of SPIDER-MAN™: HOMECOMING swinging into cinemas on July 5, Sony Pictures Releasing and FindAnyFilm are giving you the chance to win this merchandise bundle fit for a superhero including Spider-Man™: Homecoming headphones, a drawstring bag, magnets, sticker sheet and figurine, to give you a Moment to remember. In Spider-Man™: Homecoming a young Peter Parker/Spider-Man (Tom Holland), who made his sensational debut in Captain America: Civil War, begins to navigate his newfound identity as the web-slinging superhero. Thrilled by his experience with the Avengers, Peter returns home, where he lives with his Aunt May (Marisa Tomei), under the watchful eye of his new mentor Tony Stark (Robert Downey, Jr.). Peter tries to fall back into his normal daily routine – distracted by thoughts of proving himself to be more than just your friendly neighbourhood Spider-Man – but when the Vulture (Michael Keaton) emerges as a new villain, everything that Peter holds most important will be threatened. Great moments in film and TV are worth paying for, whether they’re epic moments that take your breath away or heart pounding adventure moments that have us biting our lips, they all take us on a journey and all have value. With a wealth of official ways to watch film and TV out there, as their makers intended, it’s never been easier to show your love – head to FindAnyFilm.com – where you can find all films and TV shows, all above board. To enter the giveaway follow the instructions in our competition app below! The competition ends at 23:59 on 14 July 2017. The prize consists of a Spider-Man Homecoming merchandise set which includes headphones, a drawstring bag, magnets, sticker sheet and figurine. One comment for "WIN WEB-SLINGING MERCHANDISE WITH SPIDER-MAN™: HOMECOMING – At Cinemas July 5"
Kisses & Smiles and a splendid July, master team Flicks And The City!